HomeBlogHardwood FlooringGet Discount Wood Flooring Installed in Marietta! Do you have plans to install discount wood flooring in Marietta? In case you don’t know it yet, there are a lot of benefits associated with wood flooring compared to other kinds of flooring you can find on the market right now. Wood flooring adds character, style, and warmth to properties, new and old alike. If you are concerned about the initially higher costs of this type of flooring, you can now get wood flooring at discount. Wood flooring has been proven to last a lifetime as long as necessary repairs and regular maintenance are done properly. Laminate products, linoleum, or carpets don’t often fare well in time when it comes to general wear and tear. This means you will have to replace these floorings far more often over time and in turn, it will cost you more money and time than your initial expectations. Engineered or solid wood floors are extremely resistant and durable against constant wear and tear. Since these are natural products, wood floors can also hold the warmth better compared to tiles, stone floors, and manmade laminates. This makes wood floors more comfortable, particularly during colder months. Laminates are cold to the touch all the time so despite the benefits of initial cost, such aspects will still make wood floors a more enticing alternative. Cleaning and general maintenance of wood flooring at discount is also easier. Wood floors have better resistance to dirt and liquid spills. Just a simple brushing and wiping of these is all you need, something that you can never do if you have carpeted floors. Needless to say, this offers you peace of mind, especially if you have to clean after kids or pets. Wood floors are also much better compared to carpets as far as hygiene is concerned. Allergy sufferers and pet owners will specifically benefit since wood flooring don’t harbor parasites like allergen producing spores, ticks, dust mites, or fleas. You can also say goodbye to unpleasant odors often left behind by spilt liquids or pets because it is simpler to clean your wooden floor. 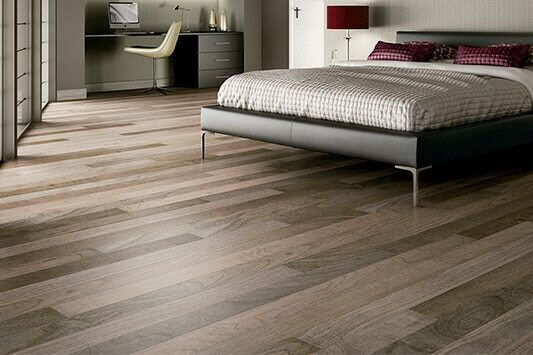 Wood flooring’s timeless is sometimes overlooked. But, unlike linoleum, tile patterns, and carpets, discount wood flooring never go in and out of fashion. No two planks are ever the same shade and color variances can add a more natural and authentic appeal to floor spaces. Through the centuries, wood floors have been used in homes so you can be sure that this same trend won’t change in the near future. This gives you the assurance that you can enjoy more money and time down the road. One more advantage is that when the floor starts to look dull and tired after several years of use, all you need to do is sand and seal them once again to revive your floors to their original state. Without a doubt, wood flooring is a great investment. 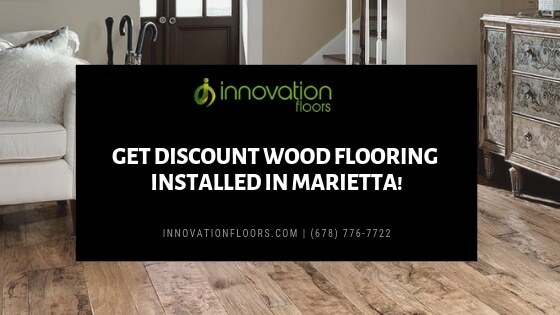 The good news is that you can now get discount wood flooring installed in Marietta for you to enjoy all these benefits and more without breaking the bank! Innovation Floors is different them most flooring companies in Atlanta. 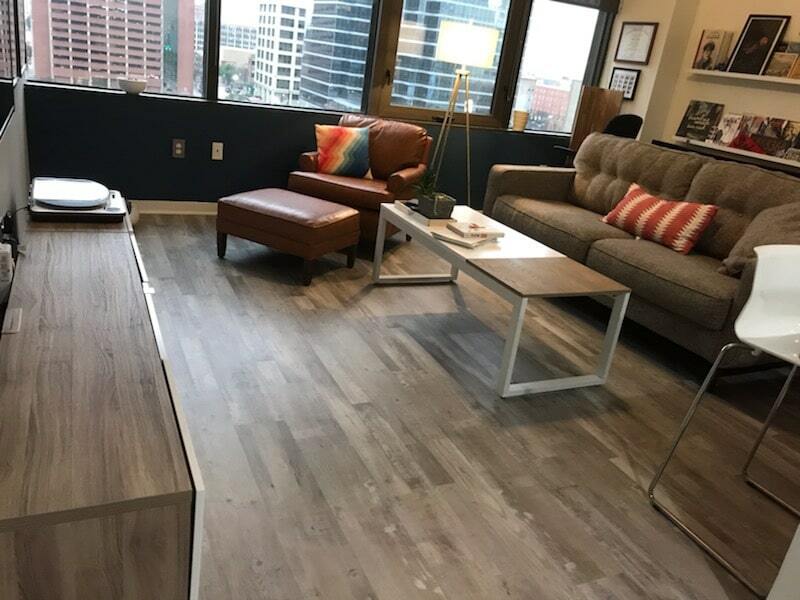 We offer a Mobile Showroom where we can come to your home, show you samples, and help you choose the best colors and options by a flooring expert. Best of all our services are significantly cheaper than other wood flooring companies in Marietta, Kennesaw, and Atlanta. Find out more by request a free in home consultation today!